The level of idleness or unproductivity among young adults in Nigeria has risen to a proportion that demands the enactment of a state of emergency on unemployment. With an estimated 170 million people, Nigeria is the most populous country in Africa. The Nigerian National Youth policy (2001:2), defines youth as comprising all young persons between the ages 18 and 35 years who are citizens of the Federal Republic of Nigeria.Meaning, the population of Nigerians below the age of 35 comprises 60% of the entire population of the country. In absolute terms there are more young people in Nigeria today than any other segment of the population. According to The World Bank, about 50 million Nigerian youths are unemployed. The National Bureau of Statistics says unemployment level was 23.9% in 2011, and that there has been an increase from 2009, so it simply means that we have up to 36million unemployed youths. Yet this figure doesn’t seem to be reducing; rather it has been on the increase with the Bureau reluctantly admitting that the rate of unemployment has been on an increase in the last three years. In other words, many Nigerian youths, more than twice the entire official population of Lagos State, wake up every day with no economically productive activity to do. Now, that is scary! Everyone Must Do Something – “for all that is necessary for the triumph of evil is that good men do nothing [or do little]”. The days of expecting governments to solve ALL problems are long gone. There is a part the government should and must play and there is a part YOU can play. All persons and institutions must bring their widow’s mite to the table. It is said that a problem understood is a problem half solved, The Unemployment Manifesto has been written to help you understand the causes and solutions to Nigeria’s unemployment challenge. it would help policy makers and government agents understand what needs to be done to win the war against unemployment. In essence, the Nigerian society and its various institutions are better off with this manifesto. 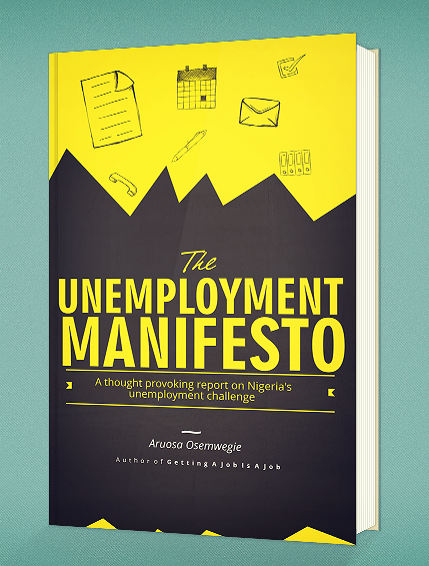 Sign up to download your personal copy of The Unemployment Manifesto by Aruosa Osemwegie NOW! It's FREE. Just enter your name and your email address below, nothing more!